Here to bring you the latest news of the electronic dance music world. Brooklyn native, Mark Martinez, has been making a name for himself in the EDM game with mixes released as early as 2012, under his DJ name 'Subset', with his undeniably skillful mixing and energetic live performances. 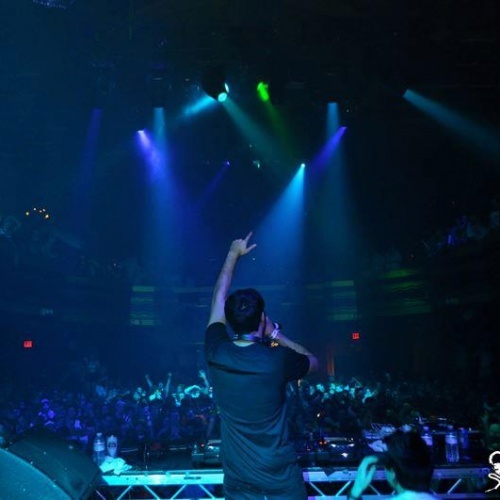 Best known as a resident DJ, he is currently one of the driving forces behind the killer acts booked week after week for the notorious 'BASSment Saturdays' at, the one and only, Webster Hall. Here's a look at the man behind those wild nights of big bass and hard partying. Subset has shared the stage with major the artists of all different genres such as Bassnectar, Pendulum, Nero, Skream & Benga, Terravita, Zeds Dead, Zedd and even Borgore. His seamless mixing of a variety of genres allows him to put out mixes you'll find yourself playing over and over again whether it be on your iPod, in your dorm or at parties. Even as I've been writing this post, I've been getting lost in the Good Vibrations mix. You want Trap? Dubstep? Garage? Rap? Hardstyle? Moombahton? Look no further, Subset blends all of these genres and more making his mixes appealing to music lovers of all genres. You can check out his mixes on his SoundCloud and follow him on Twitter to stay updated. I caught Subset's set for the first time when he opened for Figure at one of Webster Hall's Zombie Raves and have been following his releases since. I'm sure many of you guys tend to show up way after doors for the artist you're there to see but I'm here to encourage all of you to BREAK THE HABIT. Subset helped changed my view on getting to shows early to catch the openers. His set blew the crowd away, needless to say, by the time Figure was ready to go on, Subset had already, single-handedly, brought enough energy with him to keep Webster amped for the rest of the night. One hour mixes can seem a bit much for those of you with commitment issues but, with a DJ like Subset it's worth every second (I promise they won't leave your heart broken but, maybe your speakers ). One thing's for sure, this guy knows how to mix. Catch him while you can, I expect bigger and bigger things from him for years and years to come. Be sure to get your tickets to this weekend's BASSment Saturday before they sell out! An Arts Management Major at SUNY Purchase with a dedicated love for music.